After a few of my retainer aligners cracked (each under a few months), I chose the Hawley retainer hoping it would last with out a problem. I just got it yesterday but could not keep it in last night. The palate on the retainer is too thick which pushes my tongue to the back of my throat making me feel like I’m choking. Can the palate on the retainer be thinned and or adjusted? Hi, You can ask your orthodontist to change the shape of the maxillary hawley retainer into a horse shoe shape. Basically removing a large portion of the plastic covering your palate. They can also usually thin the acrylic as well. Those changes should help with choking. I’m in the process of getting braces soon. My orthodontist told me I need to get a clean up first and check my teeth before braces. I saw the dentist at the same office and got a deep cleaning done but the dentist told me I’ll need a root canal on tooth 14 before I can get braces done. I don’t have any pain right now on that tooth, and don’t want to do the root canal at this time so I wanted to ask you: Do I must do the root canal before braces or can I get braces and then do root canal after done with braces? Let’s say next year. Hello, you need to have your root canal therapy completed before starting the braces. The infection and decay will only get worse. I have a combination of clear and metal braces. I noticed dark spots on the inside of my jaw, tongue and the inside of my lips. Is this normal? Ceramic and metal braces do not cause dark spots on the oral mucosa. Consult with your orthodontist about these areas that you have noticed. My son has braces and he just got rubber bands put in today. I was not there unfortunately and could not ask a question. Will the rubber bands give him a more prominent jaw? What I mean is will the rubber bands make the jaw stick out more?They said it was for an overjet. Also, during the consultation they gave me 3 options which were get braces, take some teeth out, or get a mechanical device with rubber bands. Do you happen to know what that device is called? If your son has an excessive overjet, the majority of the time, the mandible has not grown well and is considered retrognathic. In those cases, usually the best treatment is to enhance the mandibular growth in a forward direction, in a growing child. This can be accomplished with a variety of appliances and procedures. Some of the appliances used are a herbst appliance, forsus, biobite or functional appliances, like a bionator. Any device that places the mandible in a forward position usually causes the jaw to grow. Elastic rubber bands also can be used to correct an excess overjet as well as extraction of two upper premolars and closing the space. With each of these treatment modalities, different results occur in the correction of the malocclusion. Therefore, to answer your question, the rubber bands may cause the mandible to grow in a more forward position. I hope that helps. Hi I just went to the orthodontist today. He changed my top wire to a square wire my previous wire looked thicker but this one looks thinner do square wires start out thin and get thicker? Hi, You have made a good observation. Teeth move best with light pressures. Therefore, an orthodontist will start with a small wire and move into larger wires over time. The rectangular wires are used once the initial leveling and de-rotation has occurred. Rectangular wires torques the teeth and gets that 3rd dimension of movement. So an orthodontist will start with round wires and slowly move to a rectangular wire and fill the bracket slot up so that the full expression of “built in” movement will occur from the bracket. Look at the article, “How Do Braces Work” for more information. Hello! I have a little complicated problem which I hope you may have some answers to. I got my braces off about 4 or 5 years ago and I was given a fixed wire retainer behind my front two teeth. After this I had a Fibre Reinforced Composite Bridge to replacing a missing tooth which is next to one of my front teeth. This bridge covers part of the fixed wire retainer as its attached to one of my front teeth. The other part of my wire retainer kept coming loose and coming off and I kept going to my dentist to get it fixed. My dentist has now told me that the wire is damaged and I need to go to an orthodontist to get it fixed. My question is how can they fix it if half of it is permanently attached to one of my teeth? Also I have moved to a different part of the country so I was thinking of going to a different orthodontist as the one I went to before, is this ok? Thank you for your time, and I hope this makes sense. Hi, I’m trying to visualize your situation. It will take coordination with your new orthodontist and your family dentist. I would say that your dentist would remove the composite that is covering the wire retainer and then remove the old broken wire. Your orthodontist would make a new wire and attach it to one of the teeth (not attached to the bridge). Then your dentist would secure the other side of the wire and bridge with a composite. That is just my guess. There is nothing that would keep you from working with a different orthodontist. I hope that helps. can a 2mm midline diastema be closed with a removable brace (hawley retainer) if other teeth are straight and there are no bite issues ? A 2 mm space is a little large for a hawley retainer with fingersprings to close. However, I do believe it is possible. Certain factors like angulation of the incisors, the position of the maxillary frenum and if the gum tissue is bulbous between the teeth, that will determine if the space can be closed. Thank you, if the hawley retainer isn’t possible, are their other retainers that would work? I’d say Invisalign Express 10 aligners would be my next choice. Teeth move very slowly. It takes 21 days of constant pressure to obtain tooth movement. Usually, treatment lasts for about two years. Do 12 year old molars have to be fully grown in to have braces put on? Hi. No, the 12 year old molars, (2nd molars) do not have to be fully erupted to start braces. The majority of the time, braces are placed around 11 years old before the 2nd molars erupt. Usually 2nd molars will erupt into position without help. Also, some patients require two phases of treatment and the first phase is at an early age. Patients first visit to an orthodontist should be around 6 to 8 years old. This can allow an orthodontist to develop a treatment plan and prevent certain growth patterns from getting worse. I got my braces adjusted a week ago, and before that, my 6 bottom front teeth were not attached to the wire. Now 4 of them just got attached to the wire and the 2 center ones are still not, since they want to create some more space for those 2. But after only a week, I noticed that the 4 teeth newly attached to the wire are about 3mm taller than the 2 center ones not attached to the wire. I feel those 4 teeth are moving up, since I can feel they got longer and really sensitive. is this normal? Hello, Orthodontists look at a malocclusion and move teeth in a certain order. There are certain steps and they can be in different order from one orthodontist to the next but they still can obtain the same result. Teeth do extrude during treatment, more than intrusion. I would not be concerned about how your teeth are moving at this time. You are just now starting treatment and there will be a lot of movement over the months. I have an impacted upper left incisor which was exposed a couple of years ago with a gold chain attached to it. The chain is pulled on every 6 weeks and I can finally see tooth. The pointed tip of the tooth is showing from the thin layer of gum but I was instructed by my orthodontist to brush rigorously over the gum to get the whole tooth to show before my next appointment. This would enable me to get a bracket attached to it and finally pull it down. The brushing causes soreness and minimal bleeding and I would like to know if it is the right thing to do in order to expose the tooth? Brushing the incisor’s gum tissue will cause the the gum tissue to recede faster. You don’t have to brush it hard just gently. What most people do, is don’t brush around an erupting tooth because the gum tissue is thin and sore. This allows plaque to gather around the erupting tooth causing the gum tissue to swell so it covers the tooth up more. Just keep the area clean and the tooth will continue to erupt. Yesterday I had normal braces fitted on my lower teeth and a hawley retainer fitted on my top teeth. In this retainer there is a block behind the front two teeth which I think is so the upper teeth don’t come down and hit the brackets on my lower teeth. I am finding it very uncomfortable and I can barely eat any food. My top and bottom teeth don’t meet together meaning I find it extremely hard to chew on anything. I think I remember my dentist telling me I had a 7mm overbite. Is this normal and when should I expect to be able to eat normal food again because there is only so much soup, porridge and mashed potato I can eat. You are having a normal reaction. After an adjustment, it takes about three to four days to get past the sore teeth. The hardest week is right after the braces are placed. Your upper hawley retainer is to help, as you said, keep the upper teeth from knocking off the lower brackets. It is also used to get rid of the overbite. Hang in there. You are going through the hardest part right now. It will get better. About 2 weeks ago, i got surgery done ( Impacted tooth Exposure ) they connected a chain to my braces to try and bring the tooth down and i feel like the chain came off but i can’t come to the conclusion if i did. I”ve tryed looking with a mirror but when i move it with my tongue it looks like it’s connected? Let’s say it did get disattached what should i do? If the end of the chain is still connected and the other end looks like it is coming out of your gum tissue, then everything is ok. If either side of the chain is loose, call your orthodontist and see if they want to see you early. The oral surgeon attaches the chain loosely to the braces. Your orthodontist will apply pressure at your next visit and the chain will be taut. I HAVE BRACES ON. MY LATERAL INCISOR IS BEHIND MY FRONT TOOTH AND MY CANINE. THE BRACES HAVE MOVED MY CANINE BACK BUT THERE IS STILL NO ROOM FOR MY INCISOR. THE DENTIST WANTS TO MOVE MY 2 FRONT LEFT LATERAL AND LEFT CANINE TO THE RIGHT BUT THEN MY MIDLINE WILL BE OFF. SHE SAID YOU CANT MOVE YOUR PREMOLARS. WHAT AM I TO DO BECAUSE I DONT WANT TO LOOK STUPID WITH MY MIDLINE OFF. There is no problem in getting a second opinion from an orthodontic specialist. Just call orthodontists in your area for a consultation. Without good pictures, I can’t advise you other than seek another opinion. Lateral incisors are brought out of cross bites by using compressed coil springs, sliding hooks and elastics. It is a very important tooth to keep. If any extractions are needed, we usually select the premolars. Hi, I have my orthodontist, but I feel as though my treatment has gone on for too long (7 years now) and I would like my braces to be removed before I leave for college in the fall. Am I able to tell them I just want them off? And am I able to pay a different orthodontist to take them off for me if my original one won’t do it for me? Hi, If you are of legal age, you can discontinue treatment and have the braces removed. If you are satisfied with your results, just ask the orthodontist to remove them. 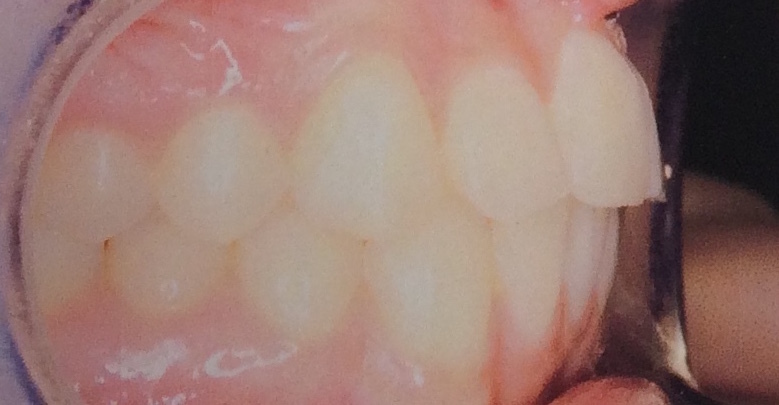 Hello , I am getting my braces of tommorrow and I’m extremely nervous that I will have the white marks on my teeth , how are these caused ? Hi, White spots are decalcified areas of enamel from plaque not being removed by brushing. Read this article. I accidentally threw my retainer at lunch today and I’m freaking out, how long will it be before my teeth are crooked and ugly again ? What should I do until I get a new retainer ? Is there anything I can do ? If you can’t retrieve the retainer from the garbage, you’ll have to call your orthodontist for an emergency visit. They take an impression quickly and start making your retainer. If your teeth move, the retainer will push them back. Call your orthodontist soon. does getting braces hurt, I am getting them soon and I was wondering if they hurt. I have had the on four of my upper teeth and that hurt. so does getting braces on all teeth hurt? Hi, Placing the braces on your teeth does not hurt. Your teeth will be sore the next day due to the pressure from the wires. Your teeth will be sore for about 3 to 4 days. Just use a soft diet and over the counter meds and slowly the soreness will go away. I have a question, I recently had all four biscupid teeth extracted for braces, after doing this believing it would help my appearance I began to search for before and after pictures online and what I found was concerning, I found videos and articles claiming that the extraction of 4 biscupid teeth causes neative changes in the face such as lengthening of the face and retruding of the jaw etc, this has made me very paranoid. I was just wondering if there is any truth to this I am 16 so my jaw is still developing, will my face shape change negatively as a result of this? Extraction of four premolars is indicated in certain cases, like severe crowding. It will not produce a retrognathic mandible, nor lengthening of the face and it will not change your profile. It does produce a stable occlusion that has little chance of relapse. I have brackets on my teeth. no wire no nothing only brackets. my teeth are badly decayed and plaque buildup is really bad. my front tooth is chipped as well. I have to have my brackets removed will it hurt? No, it should not hurt. Your orthodontist will use a de-bonding pliers and will squeeze the wings of the brackets. When that is done the base of the bracket peals off of the surface of the tooth with little or no discomfort. Can I leave my retainer out for any more than an hour if I’m eating? Or will that be too long and will I risk them not fitting when I put them back in? Hi, Wear your retainers as instructed by your orthodontist. I’d say while you are eating, leave your retainer out of your mouth. When you are done eating, place your retainer back in. Your teeth will not move that quickly and your retainers should fit fine. Hi. I got my braces off two years ago. I wear my top retainer every night with no problem, but I lost my bottom retainer (the clear plastic kind) about 6 months ago and never replaced it. My teeth have definitely shifted since then and it’s quite noticeable (to me at least). However, shockingly (I thought it had gotten thrown away on accident), I found my retainer again this morning. It fits painlessly about halfway on, but I haven’t tried any farther than that. If I attempt to force my teeth all the way in and consistently wear the retainer, will my teeth move back to straight again? Thank you! Hello, Yes, I would suggest wearing your lower retainer full time. There is a good chance that your teeth will move back into better positions. Once they are in place, you may want to visit your orthodontist. They can create more stability by performing Interproximal Reduction (IPR) in the area where the teeth are relapsing. Also, you may need a new retainers. Hi, I have a lower fixed retainer question to ask you. I have had my fixed retainer on my bottom six front teeth for 9 years now. I noticed that I have a dark black/ gray stain going all the way around the dental glue or cement where the retainer wire is glued to my bottom right bicuspid tooth. What should I do about the black stain around the dental cement ? I brush and floss my teeth twice daily and nothing seems to work on getting the black stain removed. The last time I visited my orthodontist was in May 2007 to get my lower fixed retainer placed. Thank you for responding and helping me out. Hi, it sounds like the adhesive is changing color. Some family dentists use a prophy jet to clean around the braces. At your next cleaning, ask your hygienist about the spot. There is nothing that you can do at home to get rid of the discoloration. Hi. It is true that a unilateral posterior crossbite will affect the mandibular growth. I would consider rapid palatal expansion once your daughter’s maxillary first molars are completely erupted. The RPE attaches to the 1st molars. I think the majority of posterior crossbites are corrected between ages 6 to 8 years old. I stopped wearing my retainer for about a year and my teeth have shifted slightly. Is it ok to start wearing it again even if it still fits even if there is pain? Hi. Yes, you can start wearing your retainer again. Once you have worn it full time for about two months, go see your orthodontist. They may be able to adjust your retainer or do interproximal reduction to help stabilize your teeth from moving again. Hi! I recently got my braces a couple days ago, and the metal ones on the bottom aren’t bothering me, but the ones on top are ceramic. The hooks for elastics on the bottom have a rounded ball at the end, and they don’t hurt, but the ones on top have are flat where they end, with 4 sharp corners, and they keep catching my lip and scratching it. Is there anything my orthodontist can do to fix this? It hurts so bad and I’m running out of wax! Hello. Right after braces are placed the inside of your lips will get tender. Slowing the inside of your lip toughens up and you won’t be sore. Use a lot of wax. Call your orthodontist and ask them to send you some wax through the mail or go by and pick up more. You can also find wax at a drug store or Walmart. What you are going through is normal. No adjustments are needed to the braces. I have a complicated issue and I really hope you can help me out. About a year ago, I had a removable partial of tooth #11, who had to be extracted. I finally put upper braces about 2 weeks ago. My orthodontist created a pontic attached to the orthodontic wire while waiting for the end of the treatment, where I will finally get an implant. Unfortunately, I have a space of about 6mm between the pontic (which used to be tooth #11) and my tooth #12. This causes the pontic to move around A LOT, and it can even turn around the wire. I have 2 questions: The first concerns the space between tooth #11 (replaced by the pontic) and the tooth #12. How much time do you think it will take before the space is finally closed? My first follow-up appointment is in 2 months (on August 15th) and I am afraid it is really a long time and the teeth will not move at all. The reason it takes so much time is because my orthodontist will be away for the next two months so I will not be able to see him before. Do you think it is justified or my follow-up should be sooner? My second questions concerns the pontic. The fact that it is moving constantly in my mouth when I eat, when I talk, when I have my mouth slightly open is very problematic. It has of course repercussions on my daily life because I am afraid it is move around the wire and people will notice. Since the orthodontic wire attached to the bracket glued to the pontic is the ONLY thing that holds it, I am wondering it is possible to glue a small wire on the back of the pontic (where my tongue is) to the tooth #21. It will be like a small retainer but of the length of tooth #21 and the pontic. This way the pontic will be better stabilized from both sides and it will not turn around the wire or move constantly. Also, I want to specify that tooth #21 is straight, not turned or crooked. I have send some photos to your e-mail address in case you wanted to see what I am trying to explain with the pontic and the space. A tooth moves about 1 mm per month along the wire with elastic chains. To keep your pontic from moving, your orthodontist could use a rectangular wire. That way it won’t spin. I have also used brass wire soldered above and below the wire where the pontic bracket is located. That also keeps the pontic from spinning and moving along the wire. have an impacted upper left incisor which which was exposed three years ago. I can finally see the whole tooth but it is not in line with my other teeth. It is still higher up than the rest. I have an orthodontist appointment next Friday but I would like to know what would happen next to make the tooth look more normal and in line with my other teeth. In addition I would also like to know how long this would take as I am starting university in September. Since you can see the tooth, that is great. Your orthodontist can place more efficient light pressures to bring the tooth down. I’d end up using nickel titanium wires since they never stop working while the wire is bent. It is hard to estimate how long it will take to bring the tooth down. If it is rotated, it will take some time, like 6 to 12 months to get the tooth in proper position. A MEAW wire is a multlooped edgewise arch wire. Nothing special about a bent wire. It may take a little bit of time to bend. I bend wires everyday of my practice. I do not charge to replace a broken wire. It is already included in my fee. The wires sometimes break due to work hardening. You may want to seek a second opinion. I have had my braces for about 6 months now and experience no pain. Yesterday while eating one of my brackets came off from the upper left side of my jaw and now I am feeling pain in that side of my mouth, to the point at which I cant chew on that side. Is this normal and what should I do. It sounds like your wire got bent when you were eating. Since you are in pain, visit your orthodontist soon for an emergency visit. They will examine the wire and deactivate the bend you placed in it or place a new wire. Hi! My wonderful, funny, smart 8 year old granddaughter already wears braces and has for I think about a year – maybe a little more. But on top of that the dentist gave her two blocks two wear which are supposed to bring her jaw forward a bit – or something like that. She says that she cannot eat properly with the blocks and does not like them at all!!! She is supposed to wear them every day for at least 18 hours a day but she does not always do this. The dentist says he will glue them in if she does not stay with the program but she does not want this at all! I do not think this is necessary and may be even dangerous as well as putting her through a lot of unnecessary trauma at age 8. She is exhausted fighting this battle with her dad and other grandmother while my daughter and I feel it is not necessary at this time in her life (they are separated). Is it absolutely necessary now or can it be put off until she is older or something? Please help – thanks. Hello, For some patients, it is necessary, at a young age, to create mandibular growth with an appliance. Your orthodontist is using a twin block appliance. There are other appliances that can do the same thing, like a herbst appliance or bionator. I would have the orthodontist explain to the patient why is it needed. If she understands better, she may be more compliant. I have had my braces for just over a month and am still adjusting to them. the bands around the molars are my main problem. On top, one fits the base of the tooth but is larger than my tooth at the top, there is a significant gap creating a pocket on the inside, by my tongue. It is cutting my tongue a lot. At my appointment they told me they couldn’t do anything about it. they tried to bend it in toward the tooth but it didn’t work. I want to be able to get use to them but that one is not going to stop cutting my tongue. what can I do? have them remove the band and re position it? Can they fill in the pocket so there isn’t a sharp edge? Hi, You will have to get this fixed. Your tongue will only get worse over time. First, I would ask your orthodontist to try to grind down the edge of the band that is sticking up with a small green stone. If that cannot be done, then I’d place a new band making sure it was comfortable to your tongue before cementation. Hi, i have recently had a retainer (before proper braces) fitted but today i realized it does not fit on my back right molar but my orthodontist is not open until mid-nextweek. What should i do? It is causing it to rub on my cheek alot. Hello, if you are wearing your retainer full time and it is rubbing, you may want to wear it just at night so the cheek won’t get raw. Call your orthodontist first thing to set up an appointment. Hi, I had my braces removed last week and had a bonded retainer placed on my lower six teeth. When the orthodontist was bonding the wire to my teeth she used dental floss to pull the wire close to my teeth. Well, since the floss was placed in between each tooth during bonding, now notice a slight space in between each tooth where the floss was by the gums. Will that eventually go away? Also, with my top teeth, the braces extruded my lateral incisors because they were so short. They look GREAT now but I was given a top removable retainer (hawley), and now I’m so worried about the laterals intruding again. Should I have gotten a bonded top retainer to prevent that from happening? Hi. If the lower space is still there after a month, bring it to your orthodontist’s attention. Your lateral incisors should stay. All of our teeth have an eruptive force, so they shouldn’t relapse. Many orthodontists do not use an upper bonded retainer because the lower teeth will knock the bonding off. Hii,can I wear one elastic rubber band? Today I didn’t heard my orthodontist very well so I’m just now wearing one elastic on my right side… So is it possibe to wear one or it need to be one on one side od the other on other side. Thanks! Hello. In some cases, a patient will be asked to wear an elastic on just one side. You need clarification. Call your orthodontist’s office and ask them how you are suppose to wear your elastics. It is important to wear elastics as instructed. Since you didn’t hear the orthodontists instructions clearly, give them a call. It has been a day of me getting my upper braces on and I can’t even rest my teeth on top of each other. Any contact with the teeth has a dull pain that I can’t ignore especially my molars. Is there any way I can soothe the pain? I can’t eat anything, I’ve had smoothies all day, even eating blueberries is a challenge! I am just very new to the world of braces and a little scared. Thank you. Hi. You are going through the hardest part of braces. Right after they are placed, you will have about a week or less of very sore teeth. Eat very soft foods. There is not much you can do except wait. Use your wax on areas that are rubbing your lips. In about 3 days, you will feel a lot better. Hello, I went in for my first Ortho consult a few days ago to see what my best options were for braces. After my scans, about ten minutes later I was told in order for me to fix my full ClassII overbite, I would need both of my upper bicuspids removed. I am 18 years old & am currently set to get my wisdom teeth removed due to lack of space in my mouth. My question is, with the removal of my wisdom teeth, and the use of rubber bands can I avoid getting teeth removed? I’m told removing the teeth is to give me a better smile, I’d far prefer to keep as many healthy teeth that I can, rather than having that Hollywood smile. Thoughts? Hi. In some cases, it is normal for premolars to be removed to create enough room to create a Class I occlusion. This is based on the amount of crowding, or excessive overjet that a patient has. Removing 3rd molars will not create the space in the right position to eliminate the crowding. If you are concerned about the treatment plan, you can always get a second opinion. Since the orthodontist suggested extractions, they are wanting to create a stable occlusion so that when you stop wearing retainers, you will not have relapse. Hello, If you have one space in each quadrant (corner) of the mouth, a premolar will not need to be extracted. They can close the molar space as needed. have an impacted upper left incisor which which was exposed three years ago. I was wondering if it the size and strength on the elastics are the right one to use for the job. If not, will I be able to get stronger ones by simply asking my orthodontist? Hi, It is difficult for me to give advice on your question. If you do not see a lot of change, talk with your orthodontist about going to stronger elastics as you have mentioned. Is it possible to become an orthodontist sooner than 10 years, if you do summer classes? Or is that the soonest you can do. Thank you!!!! Hi Matt, 4 years of undergrad, 4 years of dental school and 2 to 3 years of orthodontic graduate program. 10 to 11 years to complete. Dental school is usually all year long, so you are going to classes in the summer. Therefore, you can’t shorten the length of years. About the only thing you can do is apply to dental school in your third year if you have all the classes completed to apply. That would shorten the time by one year. Hi Dr. Thompson! I am in the middle of invisalign treatment. When I was a kid, a bad tooth, #19, was pulled and left with a space. When I had braces on the second time, my wisdom teeth were extracted except for #17 with the idea that the orthodontist could close the space. It closed a little, but not by much. Fast forward to my fourth orthodontist and treatment mainly to correct my midline. I’m in mid treatment and the ortho had 17 more trays made just to get my midline as perfect as possible. I previously had an incisal cant. Anyway, I just addressed that I would like to have the space closed as she said she’s confident she can do it with a TAD. Her office manager, however, wants to charge me an additional $3000 for one TAD and treatment to close the space. Being that I’m mid treatment, and only teeth #17 and #18, needing to be pulled forward, with no additional changes in invisalign trays except cutting off the affected portions, I think $3000 is a bit much. Can you give me an idea of where to go with this. I agreed to the additional treatment and had the TAD placed today. It’s not like the initial treatment was finished and I decided that I wanted to close the space. What do you suggest? Any advice would be appreciated. Thank you very much! Hi. Every orthodontist has different rules for charging for treatment and the fee is usually based on time. Moving #17 and #18 mesial by a TAD was added to the treatment plan and is very difficult to do and time consuming. The majority of cost is the number of appointments needed, which is an estimate, and not the equipment used. Your last agreement was to correct the midline with Invisalign. Now, you have added to the treatment time hence the fee. So basically im proper freaking out because im on my 7th week of having braces and getting them tightened in 2. Even though ive been brusshing and flossing after every meal (except lunch, but i do brush staight as i get home from school) for about 5 minutes each time im still getting promenant white marks all over my teeth and i dont know why because ive followed all my orthodontists instructions to the letter t! And now im really scared that she is gonna remove my braces when i go to get them tightened! Hi, Show your orthodontist your white spots and ask him/her what they are. They may be the adhesive, fluorosis or decalcification. They can tell you if it is decalcification and what to do. If you keep your teeth clean, you will greatly lessen your chances of white spots. Hi, I have recently been fitted with a twin block brace for my overbite, and I have started to notice a bad odour coming from them, and I can taste it really badly and I have not been wearing them, I clean them at least 5 times a day now and it still comes back, how do I stop this?? Hello, I would suggest over the counter denture cleaner. You can also consider an ultrasonic cleaner as well. Make sure when you take them out of your mouth, that you rinse the saliva off of them. Scrub them with your toothbrush and toothpaste. It sometimes is hard to get rid of the odor. I am in the final process of my orthodontic treatment and my doctor is saying that some gaps I have cannot be closed as the bones of the teeth are touching on top even though there are gaps in the lower ends between the teeth. The doctor says the shape of my teeth is what causes the gap. I am not convinced about this because the gaps were not there before the orthodontic treatment began.. so I’m looking to see if there is an alternative opinion/option by other doctor. Between your teeth is a piece of gum tissue called a papilla. It looks like a pyramid and it starts below the tooth’s contact point. There is no bone there, just gum tissue. In a patient who has crowding of the teeth, their papilla is reduced, not the proper size or is gone forever. When your orthodontist straightens your incisors, they may touch at the top 1/3 but not the gingival 2/3rds of the crown as you go from the incisal edge to the gingiva. If your papilla is gone, a triangle of space will show up and chances are, this is what you are describing. You can ask your orthodontist if interproximal reduction (IPR) would help close the triangle of space. IPR is a reshaping of the sides of the teeth so they can be brought closer together to reduce the triangle of space. Sometimes this works. Finally, as we age or if a patient has gum disease, the papilla usually shrinks and they end up with these triangles of space. I hope that helps in your understanding of the problem. I am currently wearing one of those clear plastic retainers on my top teeth. I dropped it on the floor the other night while cleaning it and I was wondering if it could have bent from the force. It still fits but I’m worried that it will move my teeth from their current straight position. Hi. No, just dropping your clear plastic retainer will not distort it. It is made of thermoplastic. Heat will distort it like boiling it in hot water or leaving it on the car dashboard on a hot summer day. My daughter is 7 and has spacers. Her two canine teeth were pulled and be spacers put in. Her first molar became loose a couple days ago and fell out last night. I’m worried about how this will affect her spacers. It’s the weekend so since it’s not a true emergency I don’t want to call the dentist or ortho. Thanks. Sometimes people refer to separators or space maintainers as spacers. I’m guessing you are talking about separators. I don’t think there is a problem. The separators can become loose and fall out after they have created spaces. Just call your orthodontist when their office is open and see if they need to see her. My granddaughter has a palatal expander on the roof of her mouth and what she calls a lower jaw palatal expander, that looks like forsus or herbst device. Should she be playing contact sports with these devices in her mouth or should she wait until they are removed and her braces attached? If it’s O.K. to play, what type of mouth guard would be appropriate? Hi. I would allow her to play. You need to see if your orthodontist has a mouth guard for her to use. Shock Doctors have a mouth guard for patients with orthodontic hardware. You can trim the mouth guard until it fits or have your orthodontist help you out. Look at the Shock Doctor mouth guard by clicking here. I noticed my 13month old baby boy has a crossbite.i.e. his lower 4 lower teeth covers the 3 upper teeth when he closes his mouth. Please advice what do i do?? Class III malocclusions are usually treated over a long period of time and in usually phases. When the child is 5 or 6 years old, have a consultation with an orthodontic specialist. They will want to create a treatment plan to treat the Class III malocclusion early. They may use a bite plate and reverse head gear. Addressing the Class III malocclusion early will help change the growth of the mandible and will lessen the severity of the malocclusion when treated during the second phase. Phase II treatment is usually with full braces at estimated beginning ages of 11 through 13. I’ve been wearing braces for three years now and I’ve got a problem with asymmetry of teeth. I was wondering if you would know any way to fix this because my orthodontist doesn’t sound very optimistic about this. When my canine was growing out my dentist extracted my upper premolar which caused asymmetry and my middle line off center. Is there any way to fix this? Hi. I can think of three possible solutions for a maxillary midline shift. Depending on the examination, radiographs and study models, one of these may be viable. 1) Open the premolar space. In some cases, the premolar space, where the extraction was performed, can be reopened which will shift the midline back to the facial midline. 2) Use elastics. By using anterior diagonal elastics, class II and class III elastics, a midline, that is off a little bite, can be shifted. 3) Orthognathic surgery. In some cases, a LeFort I osteotomy can be performed and shift the midline by surgically moving the maxilla. You will have to talk with your orthodontist to find out the best option. I stumbled across your website as I am in an unfavorable position with my Invisalign treatment. My orthodontist is away and unreachable for the week and my elastic hook on the right side of my mouth broke off. The left hook is still attached. I am not able to get my hook placed back on until my orthodontist is back in the office, another week. I was wondering if I should discontinue wear of the elastic on the left side until I can get my right hook fixed? Or should I continue to wear the elastic on one side only until I get the other hook back on? Hi, Julia. The best idea, in my opinion, is to stop wearing elastics until the hook is repaired. Your orthodontist may not want asymmetrical elastic wear. That’s what I would tell my patient. Even though it’s only a week, your midline could shift. Hello! I’m a 16 year-old boy and have been wearing braces since December 2014. This image1 is a photo of my progress from December 2014 through March 2015 and this image2 is my teeth right now. Yesterday, my orhodontist put me in a dilemma. He said that because my four front teeth tend to be narrower at the bottom, it would be against my mouth’s physiology/nature to try to “tilt” them together by giving them a more vertical position. So, he gave me two options. Option 1 (which he prefers) is taking the braces off now and giving the teeth a better shape by using bonding (and therefore closing the gaps). Option 2 is continuing with braces for a certain period of time so as to try and tilt/shift the teeth together into a more vertical position and close the gaps this way. He says, however, that he cannot guarantee total stability and retention after removing the braces with Option 2 and that he would have to place a permanent retainer behind my four front teeth. Personally, I believe there’s more to be done with the teeth in terms of orthodontic treatment and that I should’t resort to bonding straightaway. He gave me two weeks to consider these two options and choose the one I’d feel most comfortable with. Taking into account the pictures I’ve attached, which option would you recommend and why? Thank you a lot in advance! Hi. I would move the incisors to close the gaps. If the gaps are closed, you will not have to deal with composite bondings for the rest of your life. Your conical shaped incisors are not severe and, in my opinion, a good stable result could be achieved. For added stability, the fixed bonded retainer is a good idea. I have a plastic retainer and I accidentally dropped it and someone stepped on it. There are no cracks but I am worried that it has bent/deformed and that it will cause my straight teeth to move. Please tell me if this is possible. Yes, chances are your retainer is bent had should not be used. I’d have a new one made soon. After you disinfect it, try it in. If it feels tight, it’s bent. I have an overbite, my upper right first premolar, upper left second premolar and lower right second molar got removed. Do I still need some teeth extraction for brace to get my overbite fixed? Hi, that is hard to say. Usually extractions are done evenly, like two or four extractions. However, it is possible that your malocclusion can be corrected by three extractions. Your orthodontist has developed a treatment plan by personal examination of your occlusion and evaluating your records. Hello! I put my braces in another country and moved to Canada. I was looking for an orthodontist to continue my treatment, and there was one I liked most. I never had my wire replaced or tightened, so that was my first appointment. But I had 2 braces on the end teeth that were broken (top and bottom on one side of the jaw). But the doctor didnt put the braces back, neither he changed the wire. He said it’s OK to stay without end braces. He said he may do it later. Is it really OK? Won’t it cause assymetry in treatment? I’m worried now that he just doesn’t want to waste time, braces and wire on me. I had this braces already for 4 weeks. They are metal and self ligating. Should I go and look for another orthodontist? Hi. Leaving molar brackets off is ok. It won’t create a problem. If you are at the end of treatment, there may not be a big need to place posterior brackets if the molars are in good positions. By the way, there is not much cost in the brackets and wires used. The wires do not need to be changed every time. If you feel uncomfortable, ask your orthodontist again about changing the wires and placing the brackets. I’m a college student, and a part of my permanent retainer broke off tonight. On the bottom teeth, the very farthest right one, the glue started to not work and that bit (with the wire) just broke off. I’m away from home and won’t be able to get back to my regular orthodontist until December unless I want to miss class, and I don’t really want to do that unless absolutely necessary. What do you suggest I do? How long should I wait on this? Should I get to an orthodontist as soon as possible in my college town rather than wait to see my normal one? Call a local orthodontist for a repair. Ask how much it would cost. They are use to doing procedures like this in a college town. It should be done one appointment, easy to repair and low cost. I currently have a fixed wire retainer in my lower teeth (6 teeth). It fell off less than a year ago and I had a new one put in. However, I was eating some almonds and the glue from the two front teeth fell off. So I now have the wire glued to two teeth in each side but no glue in the middle two teeth. I was wondering if this would cause my teeth to move a lot, and how long would it take? Should I have it removed urgently? Hi. I don’t know how fast they will move if at all. It might take some time. You can either have the adhesive replaced, repairing the fixed retainer or you could have it removed. If it is removed, I’d suggest that you have a clear retainer made to hold the teeth at night. You see, when you remove a fixed retainer, you do not know if the lower anterior teeth are stable. With the clear retainer, you can slowly wean yourself off of it and watch your incisors. If they move, start wearing your clear retainer again and see your orthodontist. I went to the dental office today to have them clip a little bit of the wire from my braces that was poking into my cheek and causing blisters to form. The assistant said it was too short and small to clip off, so she used one of those dental drills to shave off the edge and make it a little smooth. However, she did it too close and ended up cutting my elastic ligature. It came right off but the wire and bracket remained on. Her and the dental doctor in charge ended up using the special glue to paste on top of my bracket to make sure the wire doesn’t fall off and stay in place. They’re in charge of general dentistry and not ortho, I’m not sure if it makes a difference. They told me to come in for a check up still and then they told me it’s okay for me to miss one elastic ligature and that everything will be changed and adjusted anyways in my next appointment with the orthodontist, which is two weeks from now. She goes from different dental clinics so it’s hard to get a hold of her. What to do? I am worried that without that elastic, it can delay the process of my tooth movement and I am in the beginning process of having braces along with spacers as well. I’m barely on my 5th day and I’ve been taking care of my teeth but the assistant broke my elastic ligature. Should I be concerned? Will it make a difference? Also, what exactly do the spacers do? The ortho just said it leaves gaps in between the back molars so the rest of the teeth can have space to move and shift. I have 7 put in place and also, does this require teeth extraction? As I do not want that. Thank you again. I’m due to have four premolars out before getting braces fitted but I also had one broken top molar(#7) that had to be extracted, my ortho said I would still need the premolar out on that side, is that normal? I was hoping the extraction of the broken molar would free up space for the rest to move back, I’m just worried I’m going to be left with too few teeth on that side although I believe my wisdom tooth will be brought forward to fill the gap. It is normal to have even spaces produced by the extractions of the 1st premolars. Your orthodontist is going to use the 1st molar and 2nd premolars as anchor units to retract the anterior teeth into the newly created 1st premolar space. Your 2nd molar is going to be extracted because it is severely broken down. It’s space is too far towards the posterior of the mouth to be used to correct your malocclusion and the 3rd molar has not erupted yet to be used as an anchor unit to move the space forward. I think your orthodontist has a good treatment plan. My son just had a MARA bite corrector appliance put in, but when he bites, the upper and lower teeth do not touch each other so he cannot chew even soft food. Our ortho said it is ok and should adjust in a few days. Its been 4 days and nothing changed. Saw a video on youtube and the teeth still touch each other. My question is shouldnt the teeth touch each other when my son bites so he can chew properly? Thanks. A MARA functional appliance makes the mandible grow by advancing the mandible with bands attached to the upper and lower molars. When the lower jaw is advanced, the posterior teeth will come out of occlusion. Most orthodontists will make the MARA to advance the bite to an edge to edge anterior occlusion. The reason for the advancement is to build in a little bit of relapse into the system. When the MARA is removed, the orthodontist is expecting some relapse of the mandible. I’d give your son a full month to adjust to the appliance. At your next appointment, if your son is still having problems chewing, or is losing weight, talk to the orthodontist about adjusting the MARA. ok so I got my palate expander put in about a week ago (for the second time) and it is beginning to feel like some of the glue on my left side is chipping off. What could this mean and what should I do. Hi, The adhesive can chip off the occlusal surface of the molars and not be a problem. If the RPE starts to feel loose, call your orthodontist for repair. Hello, i’m Sharon. I’m a sophomore in high school and i’m thinking of being an orthodontist in the future. Problem is, i dont know what college to go to and what i need to take at my four year college. Do i have to take pre-dental? Or do i just take a dental program for the four years? Read this article “How to Become an Orthodontist” It will answer a lot of your questions. My 7 year old daughter has a rapid palate expander to treat a crossed bite problem from the upper jaw not being wide enough. 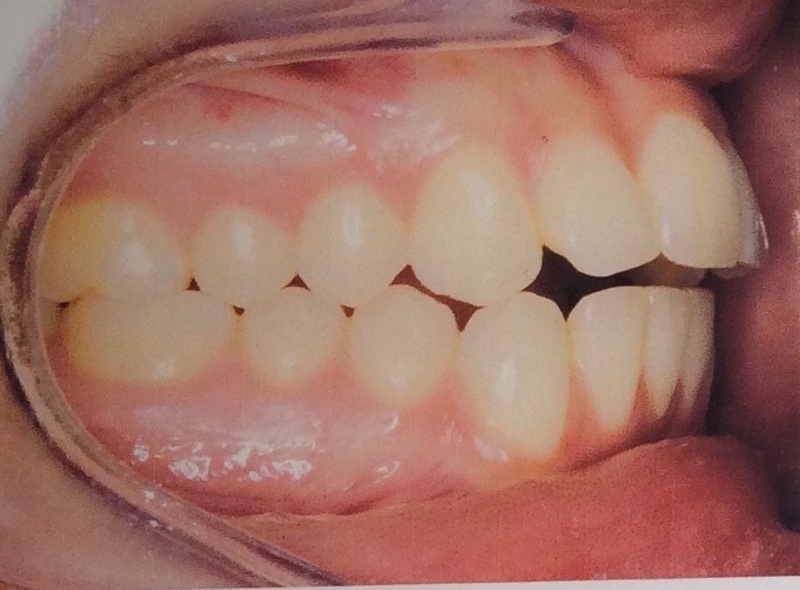 It was expanded to the correct width and then has been static for about 6 months by now, as the orthodontist has been waiting for the palate joints to firm up, and also to allow her lateral incisors to come further into place, before removing the expander and switching to a night fixture. My concern is about one of the two lateral incisors, which appears to be jammed between the canine and the front incisor, and may be starting to twist the front incisor out of alignment. Our orthodontist claims that transverse growth of the palate has already completed, and that the expander cannot be too tight at this point, and thus cannot be constricting the space for the lateral incisors to come into place. Is this correct ? I find it hard to believe that transverse growth is already finished at barely 7 years old. Even if it is, would the canines and molars tend to shift rearward to allow the lat incisors to come in ? i.e. would the expander be blocking that movement if it is normal ? The current plan is to wait another two months to allow some more time for the lateral incisors to come into place, then remove the expander and change to the nightly fixture. A rapid palatal expander helps make the transverse width of the maxilla match the width of the mandible. After the last turn of the RPE, for my patients, I wait two to three months before removing the expander. Some orthodontists like to wait longer. The palatal suture is healed and the width obtain should be stable. In a growing patient, the maxilla continues to change in the horizontal, mid-sagittal and vertical planes until the patient stops growing, about 15 y/o for girls and 17 y/o in boys. For your daughter, space was gained in the anterior segment for the incisors with the expander. If more space is needed, braces can be used to create more space. Thanks for the help… When you said “maxilla continues to change in the horizontal … planes until the patient stops growing, about 15 y/o for girls”, should I understand that to mean transverse width can continue to increase through growth, until about 15 years old ? Or does it stop earlier ? The main point of discussion I’m having with our orthodontist is whether the RPE has blocked the maxilla from growing during these 6 months since the last turn, or will continue to block it in the next 2 months before it comes off, meaning 8 months in total at a fixed width. I realize that growth comes and goes in spurts in general, but her claim is that there is no further transverse growth after 7 years old. If you left an expander in for years in a growing child, in my opinion, it will restrict growth. Read this article’s abstract. Maxillary width changed 0.90 – 0.95 mm per year up to age 14 in girl in this longitudinal study. In your situation, I don’t believe the RPE is causing a problem. The expansion has been performed and it’s going to be removed soon. You’re only talking about a fraction of a millimeter. Hello. I had to wait a week after removing braces to get my retainers, but the top retainers were not made correctly and failed to fit, the impression was remade and another week is needed before I receive them. Would my top teeth have moved significantly in these 2 weeks? Hi, Your teeth try to move the most right after braces are removed. Getting a retainer very soon after braces are removed is important to keep your teeth from moving. I have either the retainer placed the same day or the next day to diminish movements. I have an extra tooth behind my right incisor that needs to be pulled i got braces on yesterday but they didnt put a bracket on the right incisor until i get the one behind pulled. will my incisor with out a bracket still shift with my other teeth because i dont know when i will be getting the extra one pulled. Hi, Your tooth that doesn’t have a bracket will move a little bit, but it is not a problem. Eventually, they will place a bracket on it and align it. Recently I’ve put my Hawley retainer back in after 1 year to close my gap that had opened back up slightly. At first, it was quite difficult putting it in because the top plastic part of the Hawley did not fully touch the roof of my mouth but by Tuesday it finally did. So, i think that they are all the way in now. plus my gap is closing up. Hi, You will not hurt your teeth by wearing your retainer. I’d suggest wearing the retainers full time for one month then go to wearing them only during sleep. Your pain will subside in about 3 to 4 days of full time wear. After your space is closed, see your orthodontist to maybe have a fixed lingual bonded retainer in place to keep the space closed. Yes, it is normal. The brackets are placed in ideal positions so that when the wire is straight, the teeth will be in better positions. So, an orthodontist does not place brackets out of the way of your malocclusion. Your teeth will be sore for 3 to 5 days. Just hang in there. It will get better. Hi I got my braces off a few months ago and have a permanent retainer on bottom and removable hawley retainer on top. The retainer has a big crack. I’m worried because I can’t get the molds done for 4 days and then they have to ship them so probably 9 days. Will my teeth move and have spaces? Nick, if you can, wear your cracked retainer until the new one is delivered. It is possible you could have relapse since the braces have only been off a few months. Hello again. It is very uncommon to chip your enamel by hitting the bracket. What usually happens is the bracket comes off the tooth. If this happens often your orthodontist may replace the bonded bracket with a band. They are more durable to chewing forces. I was eating some chicken tonight for dinner and half of my permanent upper retainer broke off (I had overbite treatment so an upper fixed retainer was necessary). I am 7 hours away from my orthodontist because I’m at college and I won’t be able to go home until October 12th. I have my clear removable retainers in now and I’m not going to take them out unless I’m eating. Is it ok if I wait until I go home to get this fixed? Hwy. Wearing your removable retainer is good and will keep the teeth from moving. You should be fine until you visit your orthodontist. I had braces before and unfortunately ended with tmj after that. I still wearing it at night time as suggested by my doctor for past two years. pain stays for around two weeks time and goes away again. I am little worried doctor, Why its rec-curing? Most TMJ dysfunction is due to muscle tension and the splint makes your muscles relax causing the tightness/pain to diminish. zif you find yourself clinching or grinding your teeth during the day, that can cause the TMJD to flare up. Rub the soreness out and try to decrease muscle tension. That is the best way to reduce TMJ problems and pain. I get my braces off in about an hour and my front left tooth is cracked in half and only has a temporary cap over it. Will this come off when they remove the braces or if not what will happen? No the temporary shouldn’t come off. You may want to remind them that the temporary is there so they can take the bracket off a special way. I remove the wire and squeeze the bracket’s wings and the bracket comes off just fine. Hi. If you retainer stays up into your palate and doesn’t fall down, then I’d say your retainer is ok and you can wait for your next appointment. Circumferential “C” clasps don’t have to click in place. Sometimes a person’s molars do not have enough undercut to cause them to click in place. On the other hand, if the retainer falls down all the time, see your orthodontist soon for an adjustment. Here’s a pic of my teeth. I believe my two front incisors need to be rotated/tilted toward each other, so that the gap is closed. I’ve been wearing braces for 2 years and these teeth have yet to rotate (or have rotated in weird directions) which I attribute to poor positioning of the brackets. I have kept asking my orthodontist why he doesn’t place the brackets (or whatever needed) in a position so that the teeth can be rotated and come to a vertical position. He insists that the teeth CANNOT be rotated any further because that would mean messing with the roots. What do you think? Is my ortho correct? If not, how can I change his mind? I really need your help! Hello. Your orthodontist should be able to tip your central incisors mesial by placing bends in the wire and using power chain to close the space incisal to their contact point which is very gingival at the moment. IMHO, it should be simple to do and stable when accomplished. If they can’t, get a second opinion. Can I use retainers to make my teeth good even though I didn’t use braces ? Retainer can move teeth but it is a minimal minor movements. Retainers cannot move the teeth like braces or active aligners can. Consult with an orthodontic specialist. They can tell you if a retainer can work. Your orthodontist is probably over correcting the occlusion because they know that you have a higher chance of relapse. I’d continue wearing the elastics as instructed. I have white spots on my teeth and i have brace….My question is, can white spots be removed by a dentist? Like i am soon visiting my dentist for a clean up and i really hope he makes the white spots go away… So basically my question is can white spots be removed by a dentist? And do they stay on your teeth forever? Yes, usually your family dentist can remove the decalcified enamel and place a composite resin filling that is colored to match your tooth enamel. After the restoration, no one will notice the white spots. Another option is if the outside layer of the enamel has not broken through, your dentist could use an infiltrating resin, like DMG ICON Infiltrating Resin, to remove the white spot. Read this article on white spot treatment. Hi, I just got my bottom braces today and I went back to school and immediately got hit in the face with a volleyball. yes it hurt. now my teeth hurt so bad, how do i make them not hurt, and how long will they hurt? Hi. Sorry to hear about the accident. Ouch. It will take about 3 to 4 days for the pain to subside. Look at this article about how long it will hurt. hi does it hurt to get your braces off? can invisalign do canine substitution? Hi. I’ve never done a cuspid substitution case using Invisalign, but I don’t see why Invisalign couldn’t move the cuspid into a congenitally missing lateral incisor space. I have a bonded retainer on the top 4 of my teeth. I have to wear my removable retainer every night because those teeth that have the bonded retainer still shift- tiny space between my front two teeth and the one tooth next to my front tooth touches at the top but not the bottom. I went to the orthodontist and he said it wasn’t broken and he fixed it, but it is doing it again. And the teeth are shifting fast throughout the day. My dentist says my teeth and gums are beautiful, so what’s up? I take from your post that you are concerned with a space between your central incisors and that your incisors are touching near the gum tissue but apart as you go towards the incisal edge. If that is the case, I’d have the fixed retainer removed and then use either a hawley retainer or an active aligner to tip the central incisors. Once the space is closed, then replace your fixed retainer and make a new removable retainer. I have had my braces for 3 months. A week ago i got a tooth extraction, exposure and bond and chain. Now the gold chain that i have in my mouth is turning black. Should i make an emergency appointment or leave it be ? Hi. It is normal for the chain to turn color. Leave it be. Hello I hope you can help me. So since the beginning of my braces treatment I’ve noticed my top 4 brackets of the top 4 teeth seem to be more closer to the gum line than the rest. I’ve brought this to the attention of my orthodontist and the first time he told me they looked like that because my teeth were crooked and it made it seem that way. Well 8 months later even though my teeth have aligned pretty quickly I still notice the top 4 brackets are much higher than the rest of the brackets to the sides of my mouth. I’ve also noticed my overbite seems more protruded. Once again I told him and he seemed to get annoyed with the question and now his answer was he didn’t see any difference and about the protruding overbite because I chose not to get teeth extracted my teeth are protruding. Should I be concerned and why would he tell me that? I’m feeling so uneasy about it all. What should I do? Seek for a second opinion? Hi. There is no way I can make a comment about whether your bracket placements are correct. I can say that bracket placement is not determined by the distance from the gum tissue to the bracket but from the incisal edge of the tooth to the bracket. To your last question, I believe if you are concerned about your treatment, get a second opinion. Hello I would like you to tell me what possible solutions there are to fixing my teeth. Also to add if it’s not clear in the image I have underbite too and my bottom jaw is more onto one side, which can be seen clearly in photos/if I stay still. I’ve been told I have to wait till 18 (I am 16 years old) to have braces since I must have my surgery first once I have stopped growing to avoid problems. I’m very happy to have surgery… you could even say I’m really eager to have it done. I was just wondering if I could do anything to make my teeth any better during the next 2 years? Hi. A couple of things that could be considered. First, your orthodontist may want to have your 3rd molars extracted. They have to be gone 6 months prior to any surgery. Then, he/she may consider premolar extractions to relieve crowding, a SARPE (surgically assisted rapid palatal expansion), and braces for alignment prior to orthognathic surgery. I would suggest consultations with your oral surgeon and orthodontist now to determine when to begin. It takes at least a year of treatment to get the teeth in good alignment prior to having the orthognathic surgery. Hi. I’ve just got my braces fitted today and my orthodontist also stuck this plastic thing on a tooth at the back. He said it was for “crossbite” but I don’t see how a piece of plastic stuck underneath can prevent a tooth going inwards? I desperately want to rip it off; I can’t chew my food properly or close my mouth. Any advice? Thanks. Hi. Some orthodontists like to use acrylic to open a bite so that the tooth that is in crossbite can move out of crossbite. If the acrylic was not used, the tooth in crossbite would never move. Instead of an acrylic stop on a tooth, I like to use a bite plate. A bite plate is like a hawley retainer without the labial bow. It is thick in the anterior segment so that lower incisors hit it, opening the bite. It may be something that could be used instead of the acrylic. If you can’t get past the acrylic being there, talk to your orthodontist about possible other options. I came on Holiday on Saturday 22nd and I accidentally left my retainer at home. I’ve worn it each night religiously since mid July, when I got my braces removed until the 22nd of October when I came on Holiday. I even managed to attend festivals and use the damn thing. I’ve been monitoring my teeth and my bite and can tell they’re changing, more so each day I’m not using my retainer. I return home on Saturday 29th, 5PM GMT. I’m really not happy with what’s going on and I’m really uncomfortable with the situation. I know it’s my fault but I just need someone to tell me how it is. I’ve rang my orthodontist and It sounds like he just wanted me off the phone because I was “Stupid” and left my retainer at home. He just told me to try it when I get back and if it doesn’t fit, shell out £150 for a new set and keep my teeth how they’ll be after the week. When I got my braces off I had a 4 day gap where I didn’t own a retainer, it hurt like hell after 4 days and I have to sort of edge it onto my teeth. I really don’t think my retainer is going to fit come Saturday and it’s driving my insane. All I’m doing is feeling my teeth and checking my bite, I can’t relax without thinking about my damn teeth. Will my retainer fit when I return? My bite has changed somewhat-dramatically (I think). Or am I over-reacting? Please. After braces are removed, a patient goes into a phase of retention. During this phase, occlusal forces will cause the teeth to settle. Your orthodontist will adjust your retainers to guide the occlusion until you can be weaned off of the retainers and natural forces are not causing major adverse movements. This retention phase can take years. Your teeth can move a lot since you have just been wearing your retainers since mid July. Stability in your occlusion occurs over a two year period or longer. As soon as you get back, try to start wearing your retainers full time. It will hurt, but it needs to be done. If you can’t use your retainers because they’re too tight, see your orthodontist soon. They will either make new retainers or adjust your old ones. Don’ worry, it can be fixed. Most of the time, teeth are sore from newly placed braces for 5 days or less. Since you are still sore, you may want to call your orthodontist and ask if they want to see you. It may be that you are having soreness due to trauma from occlusion. Your bite may be such that you are traumatizing one tooth more than others just by biting down. I am a Speech Language Pathologist (SLP) working in a K-2 school. I have a 2nd grader (repeating 2nd grade) who transitioned from another school in my district this year. He has a very pronounced lateral lisp on the s, z, ch and j sounds. His previous SLP said she tried everything and still no progress. However, he has made progress on many other sound productions over the years. I was looking at his oral motor structure and noticed two adjacent bottom molars missing. Apparently he had cavities and the dentist extracted them. He also has a high narrow palate. The gaping hole from the missing teeth concerns me, because the tongue is most likely gravitating to that spot. He is a big boy without a lot of room for his tongue. Is a palatal expander (or any other appliance) ever recommended for speech issues? Thank you for your assistance. Yes, speech issues can indicate orthodontic treatment. If he has a high palatal vault, a rapid palatal expander is indicated. If he has an anterior open bite either a fixed tongue crib or braces can be used to close the bite and help his speech. I don’t think, the missing lower molars are causing a problem. If so, an orthodontist can make a lower hawley retainer with pontics to fill in the gaps. I believe a referral to an orthodontist would be wise. I have had braces for a year and a half now, and my bottom row has been finished for almost a year. My top row was the reason why I got braces in the first place since one of them was shifting. I have never needed to fix my bite, and all of my teeth are straight now, but my orthodontist did something to my teeth that I am confused about. He joined together my top four teeth together in a rubber band chain, leaving two large gaps separating those teeth and my canines. I don’t understand why he has done this, and even though I am in the stage now of closing these gaps up, one of them will not get any smaller, and it has been 5 appointments from the first time he chained them together. How much longer do you think it will take for the gaps to close, and why did he even make them in the first place? Orthodontists gather spaces in certain areas, one of which is around the cuspids. Once the space is gathered, your orthodontist may use a wire with a closing loop to retract the anterior incisors en mass. Space closure is done in such a way to create a Class One occlusion which is the goal. I wouldn’t worry about spaces unless your orthodontist is about to take your braces off and you still have them. Hello Dr. Thompson, I’m not sure if you have gotten this question before but I stopped wearing my retainers about a year and half ago and I haven’t been to the orthodontist for quite some time. I noticed that I do have a bit of a spacing, and one of my front teeth have shifted a little outwards. I know that its due to the fact that I haven’t been using my retainers, but I have decided that I’ll wear them if I can still realign them with my retainers. My only concern is that since my retainers are a little more difficult to put on, they do cause a lot of soreness which is alright. I’m just worried i’ll actually harm my teeth or end up with dead teeth; worst case scenario. You will not hurt your teeth by wearing a tight retainer. It is the same as wearing braces. If you wear your retainers, your teeth should move back to a better position. I’d suggest you see your orthodontist to check your retainers once you have worn them for a month. Your orthodontist could do inter-proximal reduction (IPR) of the enamel and adjust your retainers to get your teeth to move more, if needed. I had a bionator when I was 11 years old to fix my overbite. I only used it for about 3 months but my dentist said I need to use it for 6 months. Can I still use my bionator to fix my overbite ? I am 13 years old now. I’d try it. You are getting a little old. Go see your orthodontic specialist to have treatment with the bionator monitored. If the orthodontist thinks you are too old, they may want to use braces and Forsus to reduce the overjet. Hello Dr.thompson, I’ve had palatal expanders on for 3 months and I have noticed that the teeth pushed the most to the sides are the teeth that the expanders are set on. Is it strange or normal for this to occur? It is normal for the molars that are used as anchorage for an RPE to move buccal. Once the RPE is removed the molars will move back to the lingual but the palatal bone will stay wide. We usually over expand a little to compensate for relapse. because tommorow i will put. how much time needed this? I will put braces only thee top front six teeth.How much time needed this? 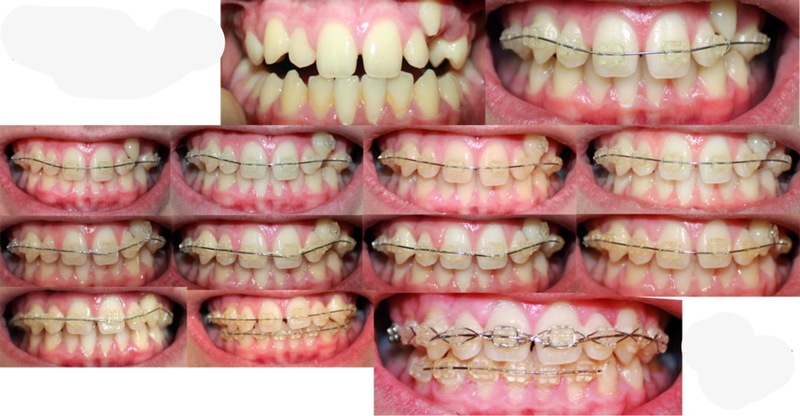 It usually takes about an hour to place full braces, top and bottom. It doesn’t hurt to have them placed. Since you are getting braces only on the upper front six teeth, it will not take long at all. My fiancee is here in the Florida panhandle area on vacation from Europe. She has braces on her bottom teeth and the last bracket on each side of her bottom braces came off. She is not due to go back for a few months. We have gone to numerous orthodontists in the area and they say that they can not help her out because she did not get her braces in their office and would have to start from the beginning. I understand the liabilities that might arise, however we just want to fix her bracket. Do you know of any orthodontist that can see her and maybe fix her brackets or does she have to wait until she gets back home? Hey, so I just got braces yesterday, and they told me I had to have them on for 30 months. Roughly 2 years and a half. My question is could I possibly get my top braces removed quicker. I ask this because the only problem I have is crowding, especially on the bottom. On the top however, I only have 4 crooked teeth, my front 4. Considering it’s only 4 teeth and I don’t have any other issues could I ask to get them removed sooner, and after how long should I ask. I like complete control of upper and lower teeth when correcting a malocclusion. During treatment an orthodontist coordinates the bends in the wires to move the teeth so there is good interdigitation. We also use interarch elastics to move whole segments of teeth which cannot be done if the braces are removed from one arch. If I were your orthodontist, I would not remove one arch of braces before all movements and your active treatment was completed. Ok,So I have a Permanent Retainer behind my lower front teeth. And sometimes it feels like it moves, is that just my teeth adjusting to it,or is it something i need to worry about? It sounds like your fixed retainer is coming loose. Give your orthodontist a call and see if it needs repaired or replaced. Ok,Thank you.Also there’s a small,hard and kinda sharp thing that’s kinds poking out from behind my right upper lateral Incisor. What is it exactly? I don’t know. Call your orthodontist. Nothing should be sharp. Hello 🙂 when I smile, I can’t help but notice that my back teeth touch, but there is a gap where my front teeth should be touching, but they don’t. What does this mean? Also, my bottom teeth, there are some that are crooked and somewhat overlap other teeth, I am concerned…I may think I need braces I would love your opinion 🙂 thank you! It sounds like you have an anterior open bite. An anterior open bite is when your posterior teeth occlude when you bite down and your anterior teeth do not overlap. This can be due to a tongue thrust when you swallow, a thumb or finger habit or a skeletal growth problem where your upper or lower jaws didn’t grow in harmony. Talk to an orthodontist about potential possible treatment. I was just given the Essix retainer, and I’m supposed to wear it 24/7 for a year. Obviously I am going to follow this advice, so my questions are more just out of curiosity. 1) Why is wearing it all day better than wear it just at night? If the retainer fits every night, what’s the problem? 2) What would happen if I wore only the bottom during the day (or only the top), and then wore top and bottom at night? 3) This one’s less out of curiosity. Will my lisp go away? 1. There are some patients who have a high chance of relapse. 24 hour wear for six months or longer is best. 2. You would increase your chances of relapse wearing them part time. Each orthodontist does retention differently, but usually 24 hour wear is necessary. 3. Your lisp will go away in about a week or less with full time wear. But I’m confused because even if they shift during the day, when I wear the retainer at night, wouldn’t they just shift back into their proper position? We don’t want your teeth to move back and forth. That’s called “round tripping”. We want your teeth to stay where we placed them. Once you are weaned off the retainers, we want a stable occlusion that doesn’t need retainers. So wearing your retainers full time keeps your teeth in good positions so that the gum tissue and bone can remodel and reduce forces placed on them to move them out of position. This is the best approach. Do as your orthodontist instructs. Ok,one more thing i’m curious about.Is it normal for those clear plastic retainers to not be as tight as they first are? Clear (Essix) retainers may start out feeling tight at first and then loosen up. That is normal. I have a palate expander and I am done turning it but I still have to have it in for 4 months is it normal for my third molar to hurt and feel loose? Hi. You are probably talking about your first molars being loose, not your third molars. RPEs are usually attached to the 1st molars and they can become mobile due to the pressure placed on them from the RPE and trauma from occlusion. Hi. My 9 year old daughter just completed one year of phase one orthodontic treatment on her upper teeth. She was a serious thumb sucker until about the age of 7 which caused an overjet. She also has an overbite and there was not enough room for some teeth to come in. The orthodontist used a rapid palatal expander and braces including a “power chain.” She will still need braces again in a few years. Now that phase one is completed, I feel he may have overcorrected her overjet. Her front teeth seem almost too vertically straight up and down. To tell you the truth, it appears (to my eye) as if the bottom tips of her front teeth are ever so slightly tipped behind the top part of the teeth where they meet the gums. I am wondering if this is common upon the completion of overjet correction? Perhaps to compensate for some expected regressive movement back? If it is overcorrected…can it be fixed? Worried, Momma. Probably the overjet was due to the thumb sucking causing the excessive overjet and incisor protrusion. The treatment was good in reducing the chance of trauma to the incisors and lessens kids teasing her about the protrusion. As far as the incisal angle, that depends on a couple of factors like how much room there is for the incisors and the width of the anterior teeth. Very upright incisors are usually seen in patients with a lot of alveolar bone space and narrow widths of the incisors. Patients with incisors angulated more towards the lips (facial) have either less alveolar room or wide incisors or both. I would not worry about the angulation of the incisors because the 2nd phase of treatment will take care of it. Hi. Yes the splint can cause your open bite by intruding your anterior incisors and cuspids. Condyle degeneration/resorption is a possibility and should be ruled out by consulting an oral surgeon. Thank you. So even though the open bite developed a few years ago, if I go to an oral surgeon now they will still be able to take images of the joint and see if that had been the cause? Sorry, one more question. 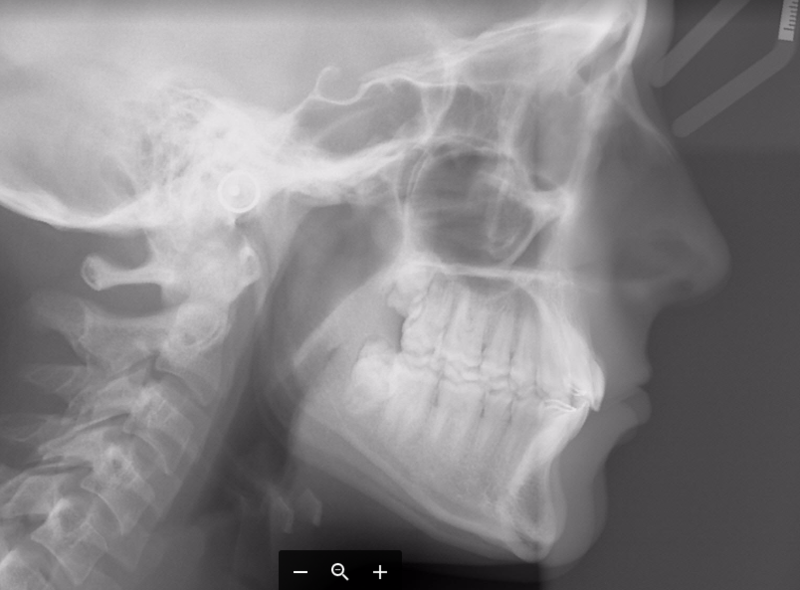 I asked my ortho to see an overlay of my xrays from before I had the open bite (I had some mild crowding, Class I bite that was fixed when I was 13) to now age 20 (I had the open bite fixed with invisalign a few months after I noticed it had developed). You can see it looks like my jaw is longer and rotated. What would cause this??? I’ve always wanted a strong jawline so seeing that it actually became less forward isn’t something I like. The change in mandibular position, IMHO, is due to maxillary and mandibular growth from your genetics expressing themselves and lengthening your face. The result from the growth moved the mandible down and posterior (clockwise). This type of movement is usually not seen and can cause an open bite. Usually, the mandibule rotates in a counter clock direction. Hello Dr. Thompson, First of all I want to thank you for this great website and answering questions. I’m 34 years old. I had to get braces because I had a baby canine tooth that never fell out. The adult canine was in the roof of my mouth. So it’s been 3 years for my braces and 2 years for the canine to be exposed. It’s moving, but very slow. They had to shave off some bone from the sides because it was too dense and wasn’t letting the canine come down. Only the tip was showing. Just recently they had to get a scan of my mouth and realized that I had more dense bone, so they did more surgery to shave off more bone. The tooth has come down a bit more now, but it’s hitting the bottom of my tooth (the one beside my canine) eating is out of the question, I’ve been living off broth and liquids for a few weeks. They now have a band that connects to the wire of my braces and to the canine to pull it to it’s position. They told me not to wear my elastic because they don’t want it to come down and hit more of the bottom tooth. They want the canine to get to it’s position first before they can pull it down. I’m wondering how long will this take? They had told me everything will take about a year to a year and a half, now it’s been 3 years and 2 years for the tooth to be exposed. Why wouldn’t they have done a scan from the beginning, instead of getting the tooth exposed and staying where it is for the past 2 years. I’ll just give you some general information about working on impacted cuspids since I can’t determine how your cuspid looks clinically from your description above. My goal is to be able to visually see the impacted cuspid before or at the one year of treatment applying pressure to it. Usually, we are pulling on the cuspid blindly and do not know how it is rotated or positioned. Once the tooth is visible, it is easier to move the tooth into position. What may occur during or even before treatment begins, is that the impacted cuspid is or becomes ankylosed and stops moving. It takes awhile to figure this out and removing bone around it will not make it move. When it is determined the cuspid is ankylosed, the only thing that can be done is to remove it. One of the clinical signs that a cuspid is not moving is that all the other teeth beside the ankylosed cuspid start to intrude towards the cuspid creating an occlusal cant. The other clinical sign is when tapping on the ankylosed tooth with blunt end of a mouth mirror, it creates a low dull pitch sound compared to other non-ankylosed teeth since the root is attached to the alveolar bone. Radiographs can be used to evaluate the eruption progress. It’s good that they can see your cuspid. It should be in position soon. I am a 60 year old female. I wore braces in my early 20s due to crowding and an overbite. I wore them for four years then a removable retainer on top and a permanent retainer for a few years. My question is that after having a sort of double crown placed over both my upper front teeth a few months ago, I have noticed that my front four teeth are beginning to tip out and is causing another overbite. My question is could this be corrected just by wearing an appliance or would I have to have full braces again. I really don’t want braces at my age. Would really love to know the problem could be fixed by just wearing a retainer or maybe a headgear at night? Hello. Chances are, you can use a maxillary hawley retainer to keep anterior teeth from moving facial. If something more is needed, you could use active clear essix retainers or Invisalign. hello, i’ve been wearing braces for 2 years now and i usually don’t wear elastics regularly. I wanted to ask if it was ok to wear 2 elastics on each side (triangles on each side) during the night and not wear them during the day. Hi. You need to wear your elastics as instructed. Full time wear moves the teeth best. My teeth are too gummy. I would like to intrude them about 5mm. Could an ortho use TADS on my upper anterior and posterior teeth to move them up? How long would this take? I have big teeth and no excess gum, so gum surgery isn’t an option. And the issue isn’t bad enough that I want jaw surgery. Hello. It sounds like you have vertical maxillary excess (VME). I’d suggest you consider the surgery route. Using TADs to cause intrusion is probably not stable and will relapse. Hi i’m in the middle of my invisalign treatment and then wisdom tooth grows and i am suggested to remove it. Can i still wear my invisalign after the removal? Hello, After your 3rd molars are removed, you should be able to wear your Invisalign aligners. So I put my braces on when I was in grade7 and took them off when I was in grade 9 , so I basically took them off before 1 month , I used the retainer for 2 weeks and stopped and now I was trying to put in again and it didn’t put , there is a gap at the sides of the upper part and it wont touch my teeth. And I feel it’s moving what can I do? Hi. You need to set up an appointment with your orthodontist. Hi I’ve had my braces for about 7 months and recently sometimes when I’ve eaten food it has forced the wire of my brace out of the bracket gradually making it longer on one side I just ignored it at first but I was eating yesterday and it forced the wire out again and the wire on the longer side went into my gum and it hurt a lot. Now I can’t pull the wire out of my gum and now my orthodontist is closed and I can’t get there until next Tuesday. How can I stop my gum from getting infected over the weekend or is there a way to get the wire out of my gum without making it worse? Any help appreciated thanks. Hi, You problem is not uncommon. Snip the wire to make yourself comfortable, if possible. Call your orthodontist for an emergency visit. Hi, I’m a 20 yr old female, I’ve previously had braces for 2 years when i was much younger, it somewhat straightened my teeth however it has not fixed my overjet (my bite is good just that my two front teeth stick out). Because of my disappointment from the treatment I have not been wearing my retainers as I should and my teeth have ‘relapsed’. When i discussed options to fix my overjet with my ortho, he said my only solution would be tooth extraction, which i’m not in favour of so i left it at that. Then recently I went to a consultation with another dentist/ortho and he said y overjet could be reduced by ‘tooth inclination’ using removable braces. So I’m wondering whether it’s going to be possible to do that as it seems too good to be true! Hi, It is hard for me to determine what should be done by your description. I’m not familiar with removable braces. I’d say you should consult with an specialist of orthodontist and the second opinion by the dentist/orthodontist may be too good to be true. Hi, I really need your advice. My son is 12 and got his braces on in October for a misaligned bite. He did not do well with them at all. By the time we had his November visit he had 5 braces off and all wires. At his December visit he had 4 braces off the entire bottom wire and part of the top. I asked the dentist to just take them off because I felt like he wasn’t ready. She was very hesitant but agreed because I really didn’t give her an option. I regret my decision everyday and have been sick over it. I am to embarrassed to call the dentist and ask her to put them back on and now that my son has had them off how will I ever get him to agree to put them back on and now we will be staring over with the pain and cuts in his mouth. Help… I am devastated with my decision. Hi, I’d wait a little time to let him grow up and go back and start again. Sometimes time will change your son’s mind about going through treatment. hello, im a student attending a college course that requires me to ask a person in my field of interest of what i want to be when i grow up . If you don’t mind may i ask for a email where i may ask some questions about this profession , because my teacher requires me to show her that i emailed a person in my profession interested.